Pearson Packaging offers custom robotic packing capabilities. Their case packing solution consists of product handling and transfer including sorting, orienting and collating. They can group products to form pack patterns including vertical and/or horizontal loading techniques, interleaved, stacked, on edge, on end, rainbow or variety packs, bulk and shelf-ready. Flexicell offers case packing systems that offer reliability in washdown, freezing, dusty, hot or humid environments. 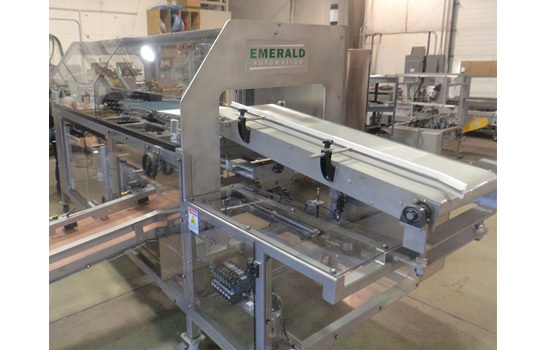 Emerald offers a variety of case packing solutions that are built to last. Their rugged designs are ready for harsh packaging environments such as fresh produce, potato processing and even frozen food production. Their case packing solutions are divided into four categories – vertical bag pack, horizontal bag pack, case formers & erectors and case positioners. All Pearson robotic top load solutions are fully-customizable to meet customer specifications. 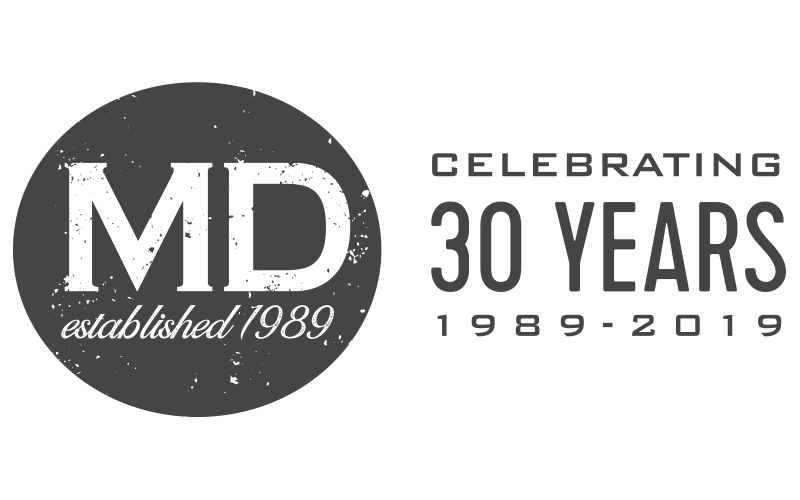 Using a variety of technologies including articulated arm and delta robots, along with custom end-of-arm tooling, we can accommodate a wide range of product styles, pack patterns, case styles, speeds, etc. in addition to meeting retail-ready requirements. Flexicell’s robotic case packing systems provide an accurate way to gently pack your products for shipping. The flexibility in design means each case packer is capable of handling one or more products, even if they vary in size and/or shape. Our robotic case packers provide versatility and reliability for manufacturers struggling with bottlenecks, reducing costs, increasing capacity, adding new product lines, and special environments. Flexicell’s carton case packing systems are designed to load a wide variety of products with the ultimate reliability, flexibility, and speed. 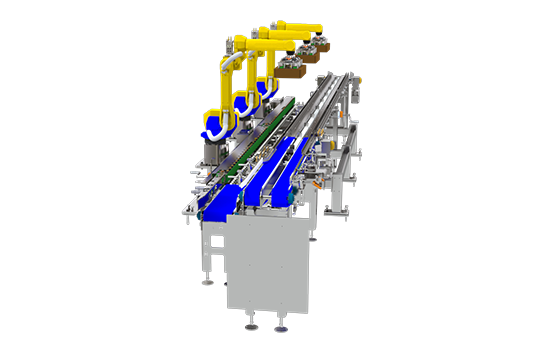 Eliminate tedious hand packing and multiple operators with a high-speed robotic carton case packing system. Robots can pack your product in any pattern with the highest accuracy while minimizing line downtime. Plus, corrosive-resistant stainless steel can be used. An end of arm tooling suitable for cups, usually a vacuum gripper, picks and places the cups to load them into cases. Often a tier sheet is placed by the robot between levels. 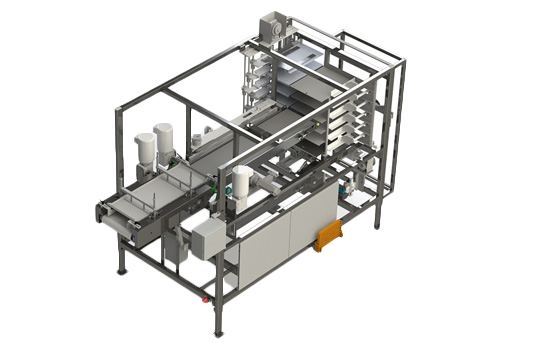 Our bag and pouch case packing systems are efficient, flexible, and reliable. How it works: Often the product is first settled with vibration before a vision-guided robot puts it in a case. The robot uses a vacuum-powered or mechanical gripper to gently pick-and-place bags from a conveyor to a box. We design and build the end of arm tooling to minimize or even eliminate breakage during the movement of product. Flexicell’s can and jar case packing systems are designed to load a wide variety of products with the ultimate reliability, flexibility, and speed. 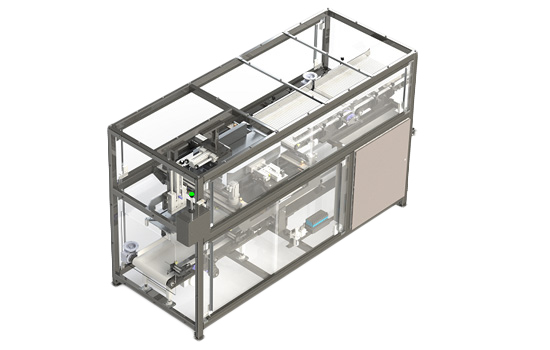 Eliminate tedious hand packing and multiple operators with a high-speed robotic case packing system. Robots can pack your product in any pattern with the highest accuracy while minimizing line downtime. Flexicell’s case packing systems pack frozen dough and baked breads, tortillas, muffins, and more. For food products such as baked goods, corrosive-resistant stainless steel can be used along with a sanitary construction to meet health standards. Before considering any robotic system integrator when your business is packaging food, make sure that their system allows a washdown that does not build up bacteria in corners and hidden cracks. All Flexicell washdown systems are constructed so everything can be cleaned completely (for example, slanted surfaces and rounded corners allow water to run off, which prevents stagnation). Flexicell’s tube case packing systems are optimized for high-speed lines and cases with or without dividers. Robots can pack your product with the highest accuracy while minimizing line downtime. For food products, corrosive-resistant stainless steel can be used along with a sanitary construction to meet health standards. Before considering any robotic system integrator when your business is packaging food, make sure that their system allows a washdown that does not build up bacteria in corners and hidden cracks. All Flexicell washdown systems are constructed so everything can be cleaned completely (for example, slanted surfaces and rounded corners allow water to run off, which prevents stagnation). Our case packing systems provide stability for your bottles or jugs. How it works: conveyors quickly move the product to a collator, which aggregates and groups the incoming products. A robot will move the group together into the case, the collation allowing the robot to move them at a high rate. Typically this is done at high-speed, but still gentle enough to prevent breakage. For beverage products, corrosive-resistant stainless steel can be used along with a sanitary construction to meet health standards. Before considering any robotic system integrator when your business is packaging bottled beverages, make sure that their system allows a washdown that does not build up bacteria in corners and hidden cracks. All Flexicell washdown systems are constructed so everything can be completely cleaned (for example, slanted surfaces and rounded corners allow water to run off, which prevents stagnation). Our Dash Series of case packers is designed for bags that are cased in a vertical orientation. We offer several models of the Dash Series to fit your specific needs and application. Consistent and reliable case packing requires an innovative and simple approach. Emerald integrates years of experience into every piece of equipment to provide rugged construction complemented with state-of-the-art technologies. Our Dash Series of case packers offers a “DP” (Drop Packer) model for bags in a flat or horizontal orientation. The Dash DPL (Drop Packer Large) is available for larger bags. Our Dash DPL case packer is designed for large, flexible bags that are cased in a horizontal orientation. Impellers or drop gates are used to drop the bags into a compression/loading section. The DPL uses a servo accumulation belt to build layers prior to feeding the impellers and to control shingling.